Storyline includes a flexible library of entrance and exit animations that you can apply to pictures, shapes, captions, text, characters, movies, and any other object you've inserted onto your slides. Select an object on your slide. 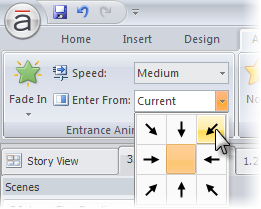 Click the None button in the Entrance Animations section of the toolbar. Choose one of the animations available. If you see an option to choose All At Once or By First Level Paragraph, it means that the object you selected is made up of multiple items. Choose All At Once if you want all the items to animate in at the same time, or choose By First Level Paragraph if you'd like the items to animate one after the other. 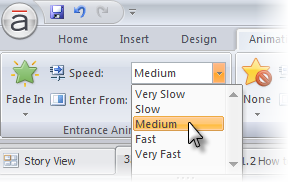 Use the Speed dropdown to select an animation speed. Use the Enter From dropdown to select the direction from which the object enters. If you see an option here for Current, this just means the object will animate in from its current location. If you want your entrance animation to happen at a specific point during the slide duration (rather than right at the beginning of the slide), check out the tutorial on Syncing Animations. If you'd like the item to also disappear from your slide at some point during the slide duration, follow the same steps as the ones above, but use the Exit Animations section of the toolbar. Can I Animate Grouped Items or Multi-Item Quiz Answers Separately? Yes! If you open Storyline's timeline, you'll see a little arrow next to the item representing the answer choices or the grouped objects. Click that to expand the group, and then you'll be able to animate each item individually. For more details, see the tutorial on how to sync animations. Can I Use Animations on Master Slides? Yes! Just click the View tab in Storyline and choose Slide Master or Feedback Master. Go to the master slide layout that contains items you want to animate. Then apply entrance or exit animations, using the steps shown above. For more on slide masters, see Using Slide Masters. How Does Storyline Handle Animations Imported from PowerPoint? All other Entrance animations from PowerPoint will be converted to Fade In. Spin emphasis animations from PowerPoint are interpreted as Spin entrance animations in Storyline. All other emphasis animations are removed from content that you import from PowerPoint. All other Exit animations from PowerPoint are converted to Fade Out. 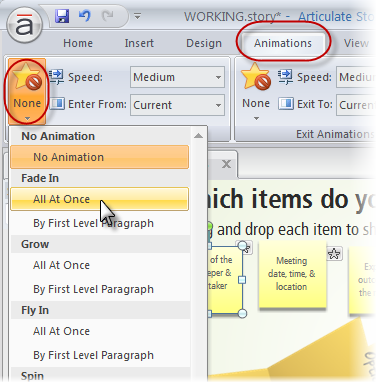 Motion path animations from PowerPoint are not supported and are removed in Storyline.